Wednesday afternoon, at exactly 2:18 p.m. 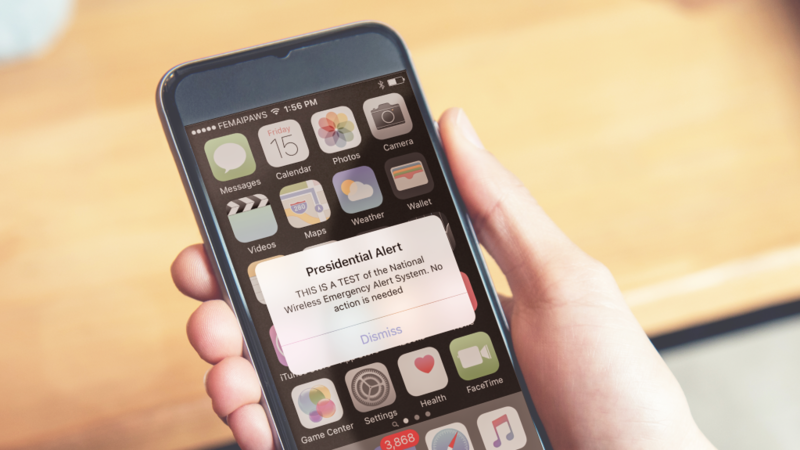 ET, you can expect to get a text headlined “Presidential Alert” on your cellphone. But it’s not exactly from President Trump. Rather, its a test of a new nationwide warning system that a president could use in case of an armed attack by another country, a cyber attack or a widespread natural disaster. During the Cold War, it was pretty common to see and hear tests of the Emergency Broadcasting System. Things are a little more sophisticated now, but basically the same minute-long, Emergency Alert System test is conducted every month or so on broadcast, cable, and satellite TV and radio. There’ll be one of those Wednesday afternoon too. But now there will also be an alert on your cellphone. Many cellphone users receive alerts now — Amber Alerts for missing children, and flash flood or tornado warnings. But Wednesday is the first time for a national, presidential alert issued by FEMA. FEMA estimates some 225 million devices, or about 75 percent of cellphone users in the U.S., will receive the alert. It will be provided by all the major carriers. And, sorry, but you can’t opt out. Irwin Redlener, director of the National Center for Disaster Preparedness at Columbia University, says testing the system “is a good idea,” and there are a variety of scenarios where it would be good for the president to speak directly to the public.